Happy Friday and this completes week 13 of That Business Show with Jamie Meloni – launched February 2nd, this new format focuses on business ownership and is on weekdays at 8am on 1250 WHNZ and you can listen live anywhere in the world via the iHeart Media app or online at http://www.tampabayradio.com. All shows are streamed live in studio across the Internet, just click on the live stream link on the home page of http://www.tampabayradio.com. Jim McPeak joined me in studio today as co-host and is an Expert Contributor to the show. 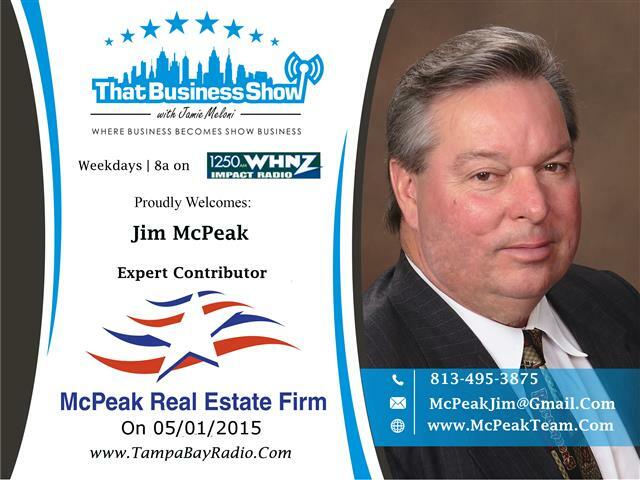 Jim Mcpeak is the broker/owner of McPeak Real Estate Firm. We discussed Jim’s recent issue he had with a local HOA whereby his for sale sign was not allowed to be displayed in the community due to the red/white/blue colors of the sign and he was fined $2000 by the association for this improper sign. We discussed some of the issues that we as bank owned property specialists have when dealing with home owner associations from the array of violations handed down against the bank owned homes in their communities to the issues we have settling past owed HOA dues prior to re-selling the home to a new owner. We also welcomed Justine Curtis who is a new agent to the McPeak Real Estate Firm and we will be chronicling her journey through Real Estate from new unlicensed agent to hopefully seasoned and accomplished Realtor in the coming year. She joins us in the 2nd segment of the show and we discuss this along with the criteria to become a licensed Florida Real Estate Professional. Learn more about the McPeak Real Estate Firm at http://www.McPeakTeam.Com and contact Jim at 813-495-3875 or email at mcpeakjim@gmail.com – they work with new home sales frequently and can assist you with all your Real Estate needs from residential to commercial! 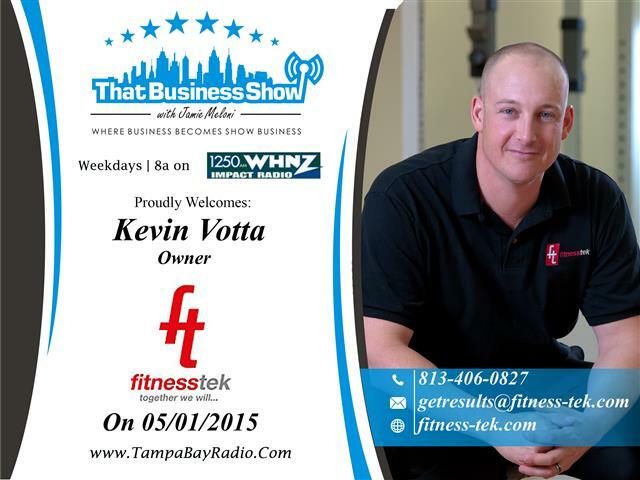 On the 2nd half of the show, I welcomed Kevin Votta in studio. Kevin Votta is the owner of Fitness Tek, a fitness outfit that focuses on Muscle Activation Techniques (MAT) and works with a wide variety of clients from entry level to rehab and weight loss. Kevin, along with his partner Kristin took ownership of Fitness Tek in 2012 and have 3 locations around the Tampa Bay area including Citrus Park / Odessa, Downtown Tampa, and Clearwater / Feathersound. Kevin and his firm work with a number of professional athletes from the area and receive a number of doctor’s patients referrals to work with on rehab and post-chemo treatments. We share some great laughs on this segment and touch on weight loss and other fitness topics as well. Check out http://www.fitness-tek.com for more information on their program and you can reach Kevin directly at 813-406-0827 or email at getresults@fitness-tek.com for more information!